Have profits at your shop stalled? Do you struggle with getting everything done in your shop on a daily basis? Are you doing enough to attract and retain quality customers? Over the past 50 years, we've provided accounting and payroll services for many auto repair shops in the Twin Cities area, and we've noticed some common traits among the top shops. 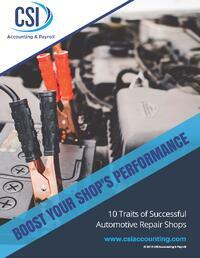 Download your copy and start increasing profits for your auto repair business today!